Pumpkin Pie does wonders for seasonally induced home-sickness. Don’t laugh, it’s a valid northern-hemisphere-displaced-persons affliction. It occurs in June — when it gets cold and you keep hoping the Christmas lights will appear, and then again in November — when you go to the beach on the weekends and see Christmas lights on the way home. With Thanksgiving only a few days away, it has kicked into high gear. To most people, Thanksgiving – after the, well, ‘giving of thanks’ of course — is all about the turkey. We grow up making hand-print paintings and paper-plate crafts and decorated cookies of multi-coloured gobblers. Not to mention giving a big old roast one pride of place at the Thanksgiving table. But to me, turkey always just got in the way of the stuffing and the sweet potatoes and the cranberry sauce and the homemade rolls and ultimately, the Pumpkin Pie. That said, Thanksgiving, first and foremost, even before pie, means family to me. Family, closely followed by crisp autumn weather – and sometimes snow, and days of cooking and stacks of food, and board games and laughter, and the start of the holiday season. However, for quite a few years now it also means that all of these things are happening thousands of miles away. Pumpkin Pie makes that distance feel a bit smaller. 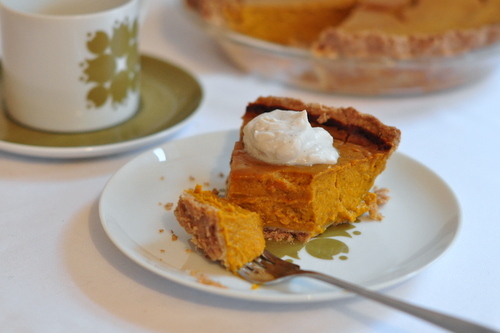 This year even though we have changed how we eat, there was no chance of sacrificing Pumpkin Pie – or one ounce of its deliciousness. Ironically, just this past weekend my brother, who recently discovered a dairy allergy [amongst pretty much everything else including soy and plants and probably air, but interestingly not nuts or gluten] requested a recipe for Pumpkin Pie. 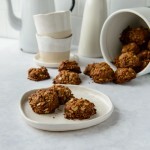 A few simple changes and here we are… whole grain, no dairy and no sugar — yet absolutely unbelievable. I shall be eating this directly from the fridge all week. Perfection, as long as you ignore the cracks. 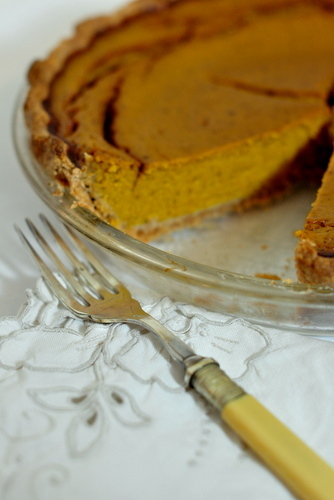 Pumpkin pie with no dairy and no refined sugar — all the taste with none of the sacrifice! Preheat oven to 180°C (350°F). Line a pie plate with Whole Spelt Crust dough, crimp to create a high edge, and refrigerate for 15 minutes. 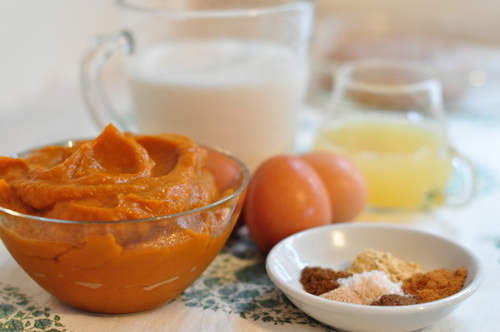 In a large bowl slowly whisk almond milk into pumpkin until smooth. 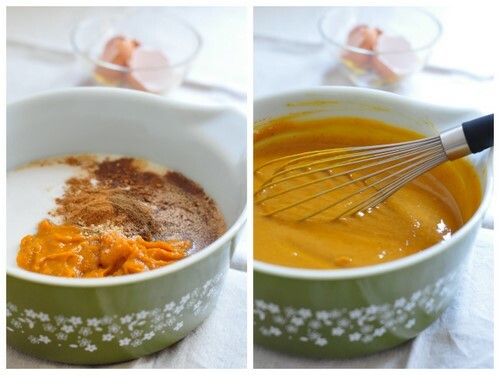 Whisk in juice, eggs and spices. Place pie pan on a baking tray and place the tray on the oven rack. Carefully pour in filling and bake for 45 – 50 minutes until centre is just jiggly. Turn off oven, prop open door and let pie cool completely. You can also remove it and cool on a rack but it will be more prone to cracking. Serve with Whipped Coconut Cream or ice cream. 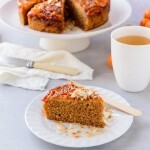 Pumpkin: I used my usual Jap [Kent] Pumpkin, roasted to concentrate the flavour and make it sweeter. Butternut would work really well too. According to my bro, in American-land Kabocha is in season right now, and after looking it up I recon it would be perfect for this. If you steam instead of roasting you may want to let the puree drain in a sieve for a day or so first. Sugar: due to the sweetness of the pumpkin and the apple juice I didn’t add any sugar at all. Mix up the filling and take a taste (do this before adding the eggs if it makes you squeamish). If you think it needs to be sweeter add in up to ¼ cup maple syrup, rice syrup, apple juice concentrate or honey. You can also add a Tbsp or two of coconut sugar if that suits you better. 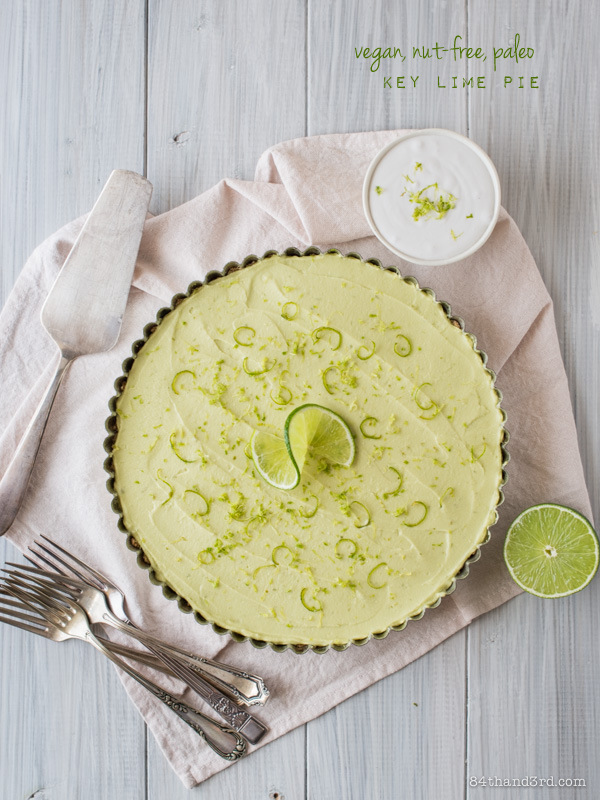 Crust: the custard can be baked without a crust (like this pie) if that’s your thing. You can also use any un-baked crust dough you prefer. Filling: depending on the size of your pie pan you may end up with a bit of left over filling. 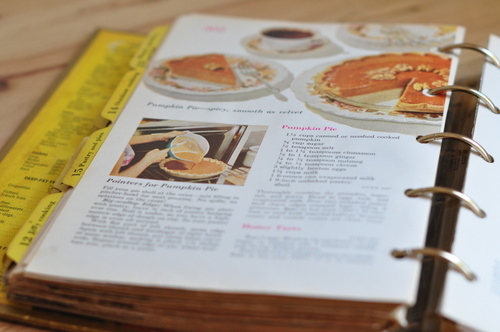 Pour into a oven safe mug and bake along with the pie. Eat with a spoon while everyone else waits for the pie to cool. I’m so impressed you managed to make that sugar and dairy free! Here, here for combating holiday homesickness with cinnamon and allspice! 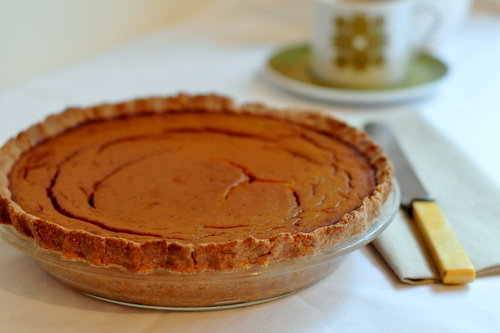 I am committed to making at least two pumpkin pies in the next week – I’ll have to give this one a try. I’ve gotten the cracks in a couple of mine before, but I don’t mind them – it’s not imperfect, it’s rustic! 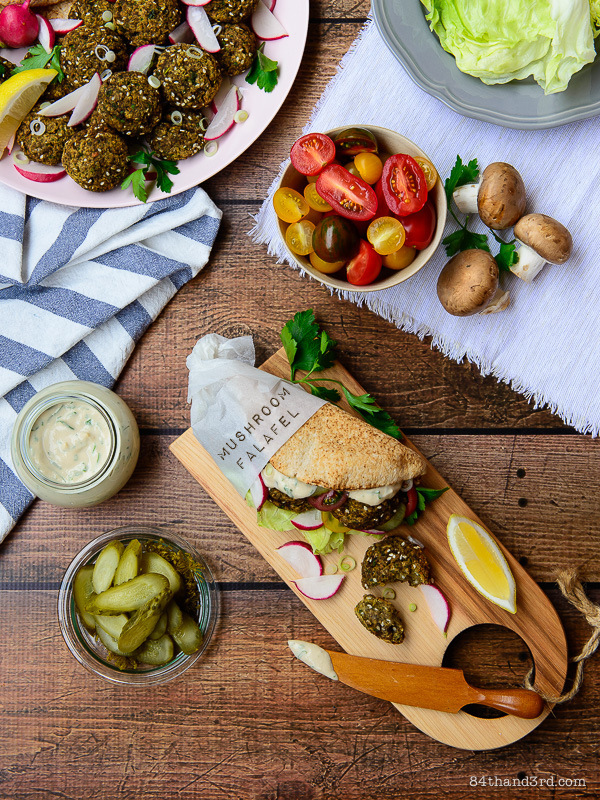 Rustic, yep, going with that… tastes just as good! omg i heart pumpkin pie! and i agree with leah, cracks makes it look rustic! I am locked in to making one of these soon! Looks awesome..